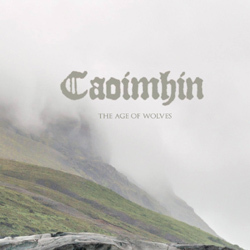 International black metal project Caoimhín has just released its debut 2-track EP “The Age of Wolves” via Black Lion Records. It is available digitally for now, but it will also be released in a 4-panel digipak CD edition limited to 200 copies shipping out on or around May 25, 2017. It was recorded, mixed and mastered by Tom Simonsen at the Secret Quarters studios. Rooted in Norse mythology and haunted by a pervasive sorrow, “The Age of Wolves” is a melodic journey through the ancient forests of the north. “Víðarr” is a powerful ode to the bravery of Óðinn’s son. By killing the great wolf Fenrir, he avenges his father’s death and sets the world on a new cycle of death and rebirth. Cecilie Langlie and Kjetil Ottersen’s voices bring the song to new heights of beauty and depths of despair. “Níðhöggr”, based on the evil serpent who feeds on the dead, is a reminder of the ferocity and sheer ruthlessness of the natural world. Cecilie and Kjetil’s familiar voices also grace this track, but now Andrew Malone lends his voice – the scream of Yggdrasil as its roots are lacerated by the dragon’s fangs.